Moving? How about the house itself! It is amazing how many antique homes we show that were moved to the Cape from Nantucket in olden days! One of my favorite programs on WCAI radio is A Cape Cod Notebook. 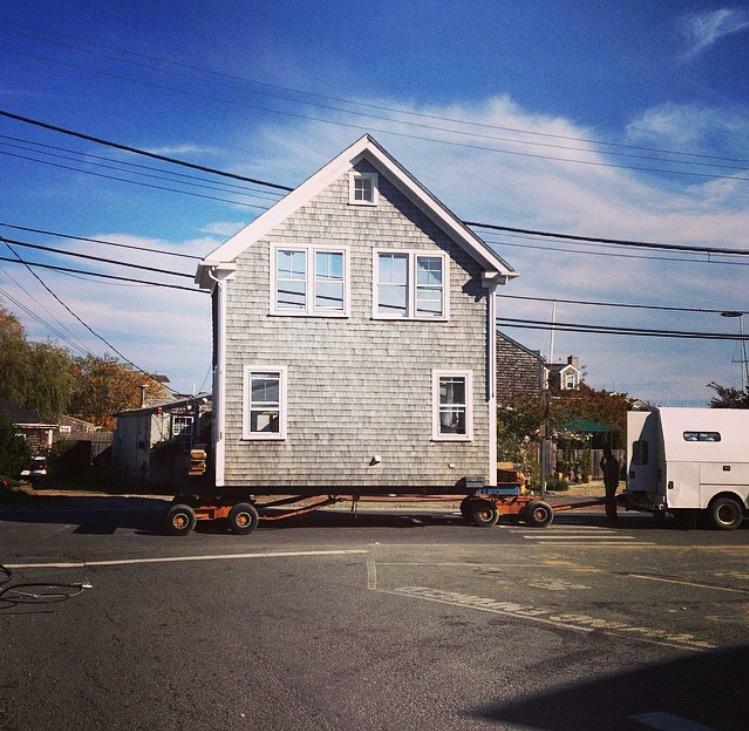 Last week, commentator Mary Bergman talked about how antique homes get moved quite often on Nantucket. You can listen to her segment here. “When you live 30 miles out to sea, many things get reused, redistributed and shifted around. I once heard an antique dealer on Nantucket say he’d sold the same scrimshawed whale’s tooth three separate times. The buyers kept departing, one way or another, but the antiques remained. Houses here are sometimes sold completely furnished–it’s easier than trying to take everything with you when you move off-island. I’ve benefited immensely from countless estate sales, or even the occasional end table left waiting for me on the side of the road. I don’t think there is a single thing in my house that didn’t come from somebody else. Even my cat was salvaged, after being returned to the animal shelter…twice. But the most ambitious thing Nantucketers reuse are houses. You’ll see houses advertised for sale–for $1– in the paper. All you have to do is move it. These are houses that are often in good shape, but don’t suit the tastes of the new owners. I wonder how many of these houses in motion began their lives as somebody’s dream house. All you have to do is watch the real estate market and the demolition requests to know that one man’s treasure is another’s trash. Now that fall is here and the traffic, such that it is, has died down, it’s not unusual to turn down Milestone or Madaket Road and find yourself stuck behind one half of a house, slowly chugging along. It’d be inconvenient if it wasn’t so impressive. It doesn’t matter how many times I see a house move, I still find it fantastic. Something out of a dream. So many of the houses look the same out here, the same weathered grey shingles, the same white trim. There are stories of summer renters who, coming home in the fog, can’t tell the difference between this house or that house and end up in the wrong one. When a house is moved, sliced in half or thirds and jacked up in the air, curtains still billowing in the windows, it’s finally set apart from all the other earth-bound dwellings, elevated. We have more house moves than any town in the state. If you are late to work, it’s a perfectly acceptable excuse to say you were stuck behind a house. They always seem to be on the move when you have somewhere you have to be. It’s not just the houses that are moving–the very sand under our feet is, too. You can look at time-lapse photos of the sand as it moves around the coastline like a conveyor belt, watch Esther Island as it detaches and reattaches to the western shore. There are some parts of the island growing larger–where the sand is deposited–and other places where the sand is only being taken. The dream houses built along those unlucky stretches of coastline will have to be moved sooner or later, too. Those house movings are less novel. They’re more like a solemn march made in desperation, retreating away from the receding shore.